Hello. My name is Steve Konarzewski, and I am the proud owner of Squeegee Klean. I am a young entrepreneur living my version of the American dream. I was born and raised in Scranton, Pennsylvania. During my 18 years in Scranton, I attended both public and private high schools, graduating from Bishop O’Hara High School in 2001. After high school I entered Lock Haven University, initially majoring in health sciences but later changing to business. As a teenager growing up in Scranton, I always knew I wanted to be self-employed when I entered the working world. I started cutting hair at the age of 16, and while in college I used my talents in this field to generate extra income. During my freshman year at Lock Haven, I also had the opportunity to work with a good friend and business associate who owned a window-cleaning company in Montgomery County, Pennsylvania. When school was out of session, I would clean windows for my friend’s company. While school was in session I was a full-time student and part-time barber. From those experiences, I became convinced that I had what it took to be successful as an entrepreneur. I am one of those people who believe that things happen for a reason, and fate intervened in my career during the summer of 2003 when I met my fiancé, Morgan, in Ocean City, Maryland. She was born and raised in the York area and introduced me to her hometown. After summer ended and I went back to school, we were able to maintain a long-distance relationship. The following summer, I had the opportunity to do my internship with my friend’s company back in Montgomery County, I Do Windows Inc. While most people complete their internships and then return to school, I decided to take a different approach. I had learned the window-cleaning business inside and out, and I believed it was time to put my knowledge and ambition to work. 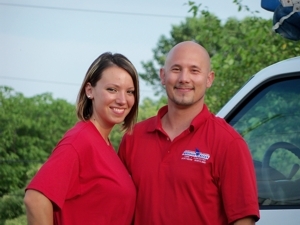 In the summer of 2004 I moved to York County knowing fewer than six people in the area, and started my own window-cleaning company. At the same time, I began attending Penn State’s York campus full time. Going to school and running my business was challenging, but it was a challenge I enjoyed. After watching my company grow significantly during its first two years of operation, I was faced with an important life decision. I could either continue in school and stop building my business, or devote my full attention to Squeegee Klean. I chose the latter route, withdrawing from Penn State with only 18 credits needed to graduate. Some day, I may return to school to get my degree. In the meantime, I am grateful for this opportunity to own, manage and build a successful business. 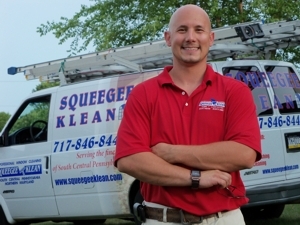 Since making Squeegee Klean my full-time endeavor, our business has grown tremendously. I attribute this to the quality of our work and the attention to detail that we bring to every job, along with the growth of York County itself. We embrace this growth, but also commit ourselves to never letting quality or safety suffer at the expense of our size. As long as we are able to treat each customer as if they were our only customer, we will continue to accept new business. I have always been a determined person who believes that anything is possible with perseverance and hard work. But if there is just one thing I would like you to know about me, it is that I enjoy making people happy. Pleasing my customers and seeing the smiles on their faces when we leave their home or place of business is, for me, priceless. I would like to thank all my customers for making Squeegee Klean’s success possible. I also would like to extend an offer to new customers to experience the Squeegee Klean difference. I guarantee that you will be pleased with the experience.